Examples, solutions, and videos to help Grade 2 students learn how to add within 100 using properties of addition to make a ten. 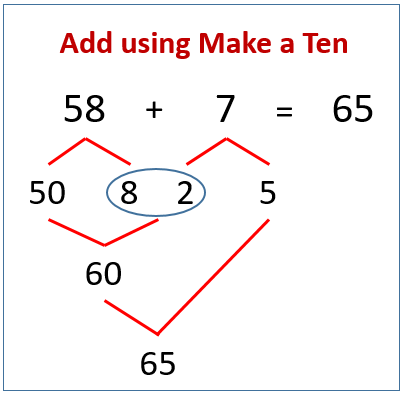 The following example shows how to add by making a ten. Scroll down the page for more examples and solutions. Solve the addition problems. Draw your bonds. 5. Lucy spent $8 on a game. She started with $14. How much money does Lucy have left?